A new patent has been discovered that details a revised Dashboard system in Mac OS X that allows for multiple Dashboard environments and a new method of managing widgets. On the surface, that might not seem too exciting since Dashboard has been around for ages, but when you look at the patent diagrams, see the inventor list, and consider recent rumors that iOS 5 will likely include widgets, you start to see there’s a potential relationship developing here between iOS and Mac OS X. 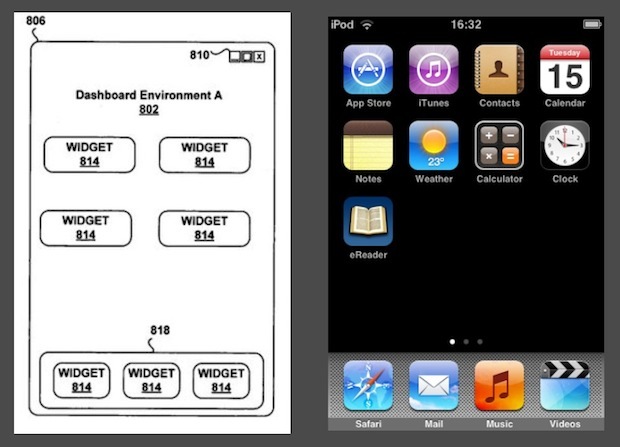 The patent specifies widgets, but what if iOS apps could run as widgets on a revised Dashboard in Mac OS X? What if the “multiple Dashboard” screens were like the multiple iOS home screens that you can swipe between? I wrote about the possibility of iOS coming to the Mac as a Dashboard replacement last year, and I continue to think it’s a compelling way to merge the two platforms. Don’t forget there’s another Apple patent out there showing an iMac touch that runs iOS and Mac OS X, so it’s probably not a matter of “if” it’s a matter of “when” this will happen. Further cross pollination is expected if iOS 5 actually does include the ability to run widgets, which presumably would be similar to the widgets already available in Mac OS X. The other interesting aspect of the patent application is that Scott Forstall is listed as one of the inventors. If you aren’t familiar with that name, Scott Forstall is the the Senior Vice President of iOS Software at Apple, he reports directly to Steve Jobs and is considered to be one of the masterminds behind Mac OS X and iOS. Prior to being the SVP of iOS Software, Forstall was a Senior Director on Mac OS X. But he switched to the iPhone role in 2008, so why would he be listed on a Mac OS X patent in 2011? More evidence or am I reading too much into this? « WWDC 2011: Steve Jobs, Mac OS X Lion, iOS 5, iCloud Confirmed. MacBook Air & iPhone 4S Maybe?